The Duke and Duchess of Sussex joined a large gathering of royals at Buckingham Palace for the Queen's pre-Christmas luncheon this afternoon. 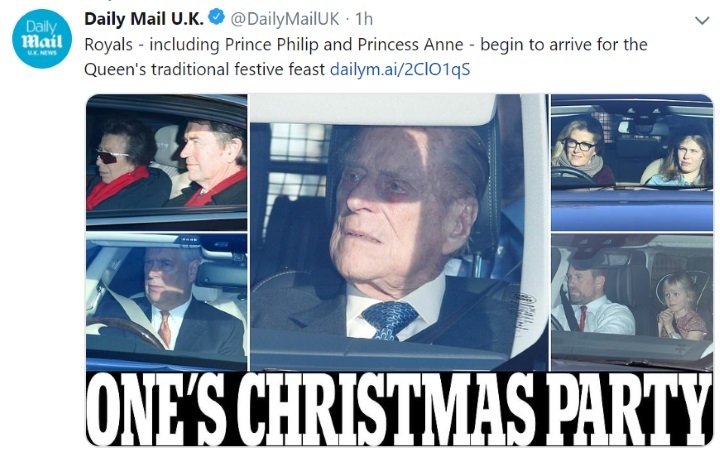 Her Majesty hosts the fifty-strong luncheon every year for the entire extended family, many of whom are spending Christmas with their own children and grandchildren rather than joining the annual gathering at Sandringham. It is one of very few occasions where so many members of the Royal family are assembled together. The royals usually stay for a couple of hours before departing. It is said the Queen takes attendance at the luncheon very seriously and family members rarely miss the event. Last year Meghan attended the luncheon for the very first time following the engagement announcement. This year, she's a fully fledged member of the family and she and Harry will once again enjoy the festivities with the Royal family at Sandringham next week. It's been a hectic year, and I'm sure they are both looking forward to unwinding in Norfolk. Below, Prince Philip arriving from Windsor; Princess Anne, Prince Andrew, the Wessexes and Peter Phillips and his family. Buckingham Palace is beautifully decorated for Christmas. I imagine the children in particular adore seeing the trees and ornaments on display. Every year, three trees are placed in the Marble Hall - and a garland is fixed along the grand staircase. The custom of displaying Christmas trees was introduced to Britain in the late 18th by Queen Charlotte, consort of King George III, although it was a yew tree rather than a fir that was used. The trees are grown in Windsor. The royal kitchens are particular busy at this time of year creating delicious festive treats. 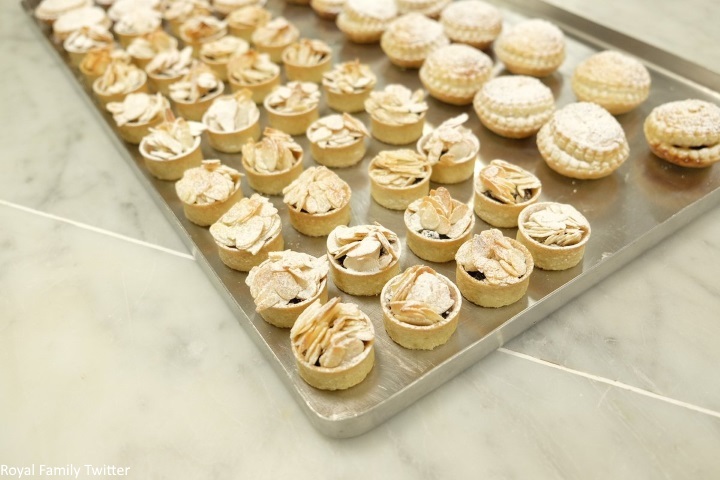 Chefs will create over 12,000 mince pies for receptions and lunches this month. 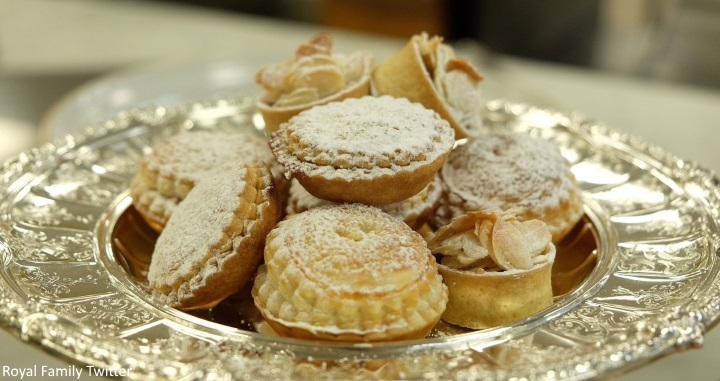 'Give yourself plenty of time,' says royal pastry chef Kathryn Cuthbertson — It's her number one tip to anyone making mince pies this Christmas. 'Pastry is not something that likes to be rushed,' agrees Chef de Partie, Victoria Scupham, who Kathryn hired six years ago to work alongside her. They also recommend 'having cold hands' when working with pastry, which will help keep it at the right consistency. 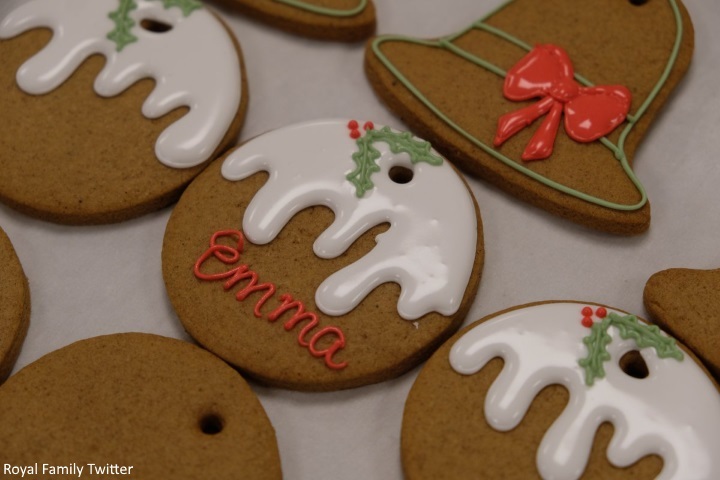 Take a look at the handmade ginger biscuits. If interested in creating your own, the royals chefs share their recipe here. It turns out Meghan did a little digging in her own closest today, choosing a floral Erdem dress from the Autumn/Winter 2015 Collection she wore for a 2016 appearance on The Today Show (with thanks to What Meghan Wore and UFO No More for terrific detective work on this). Click here to view the segment from Meghan's appearance. 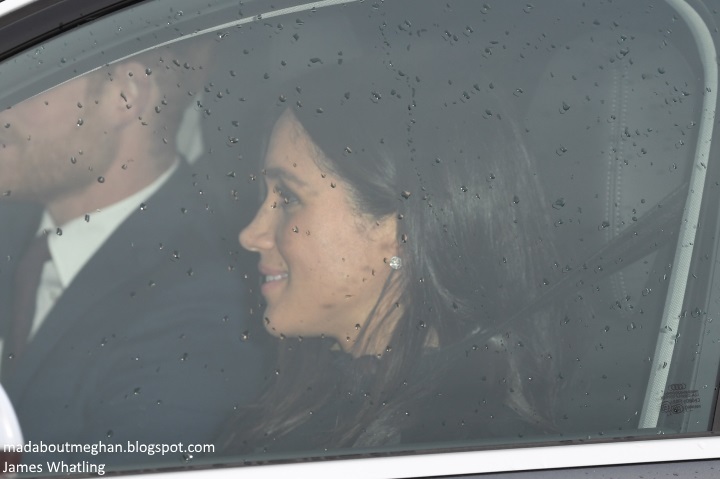 We can also see Meghan accessorised with her Cartier Galanterie stud earrings. She wore the pair on her wedding day. 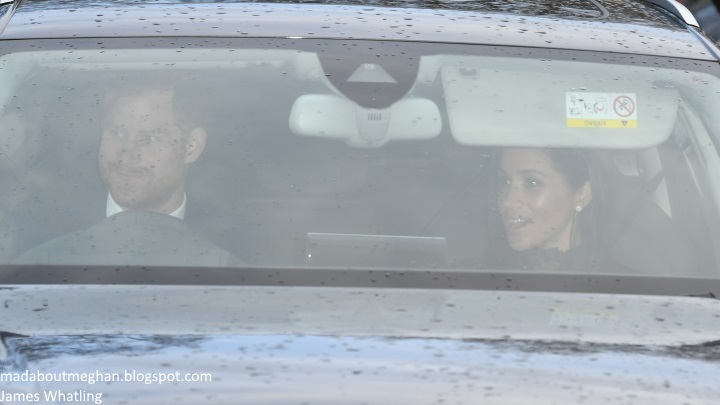 An additional image of the couple arriving (which can be viewed here) appears to show Meghan is wearing her Gillian Anderson for Winser London wool swing coat. We'll see Harry and Meghan on Christmas morning for service at Sandringham! I think everyone looks happy and healthy! Merry Christmas! Seeing them together, their glow, always makes me so so so so so happy! Hope we get more pictures of them together. Love you Duke and Duchess of Sussex! Merry Christmas and God bless you! Thank you, Charlotte. But these two pictures give me a taste already. I see that the future mother is radiant as always. 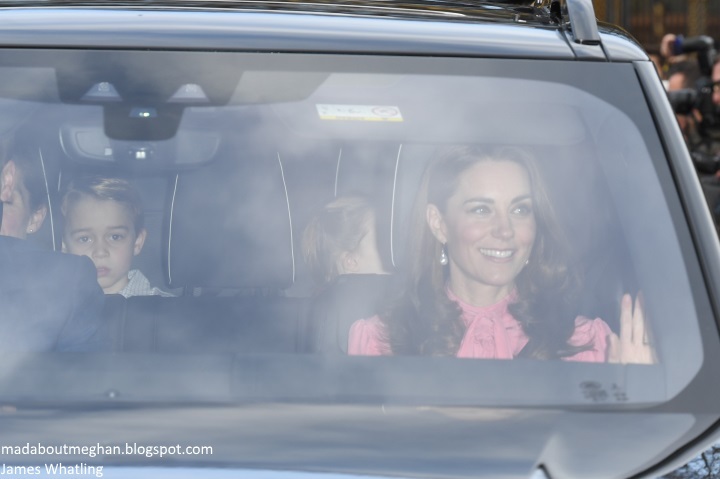 I wish Harry would get a booster seat so we can see what Meghan is wearing -- I think her few inches less than Kate's height makes a big difference for watchers. Just saying' there's a distinct disadvantage---we couldn't see the dress she wore to Pippa's reception. Heels don't help when you're sitting down. All we get is a little flurry around the neck while we get a good 12 inches of Kate's outfits. Would be easy to slide in a few telephone books. Mad about Meghan, all simply. Thanks Charlotte, thanks Prince Harry. Exactly, mad about duchess Meghan. Has she had her wedding ring changed to white gold? I sincerely doubt it. By tradition, royal brides have their weddung rings made from a cache of Welsh yellow gold. I assume that's why Harry chose a yellow gold setting for her engagement ring. In the engagement interview, Harry said Meghan’s engagement ring was set in yellow gold because Meghan wants yellow gold. No Harry chose yellow gold because it her favourite. I didn't remember any discussion about the type/color of metal in the engagement ring. Guess I was too focused on the origin of the diamonds. I also didn't realize Meghan requested yellow gold for her ring but it is a flattering color on her. Oh no, not Erdem. I rarely like his designs, but she looks pretty, regardless of my thoughts on the dress. If the dress is from 2015, I'd imagine it must be very very snug on Meghan right now. It really doesn't look like a dress that would fit well on her today. She probably had it altered. And it looks like the waist of the dress has a garter which would make it easier to alter/expand. I think it's the chest area that might have required more work. I was thinking the same thing! That fabric doesn’t seem to have any give in the Today Show clip. I can’t imagine that would be very comfortable. I would feel like a stuffed sausage. She really doesn’t want to embrace maternity wear. I’m curious why? Anyone have thoughts on this? That is why I wondered if it was the same dress? Anon 20:07, I don't have any idea why Meghan does not wear maternity but several young women I work with do not as well although they really should. From talking to them, there seems to be a snobbery against it as well as some pride that even though they are in their second trimesters they still fit in regular clothes and don't need to wear maternity. My thoughts are she is high fashion. Not to say she doesn’t dress casual sometimes but even that is high end stuff. I think she doesn’t want to let that go? Maternity has come a long way but it still doesn’t look like the clothes she usually goes for. But instead of getting a bespoke piece from a designer she is just trying to fit into high end. I think a lot of first time moms don’t want to lose themselves, so they think they can size up in their preferred clothes. That just doesn’t work. It’s not that you just gain weight, your whole body shifts and it requires a total different cut of fabric. Kinda like when parents fight tooth and nail not to get a minivan and then after 2 kids they just cave in! 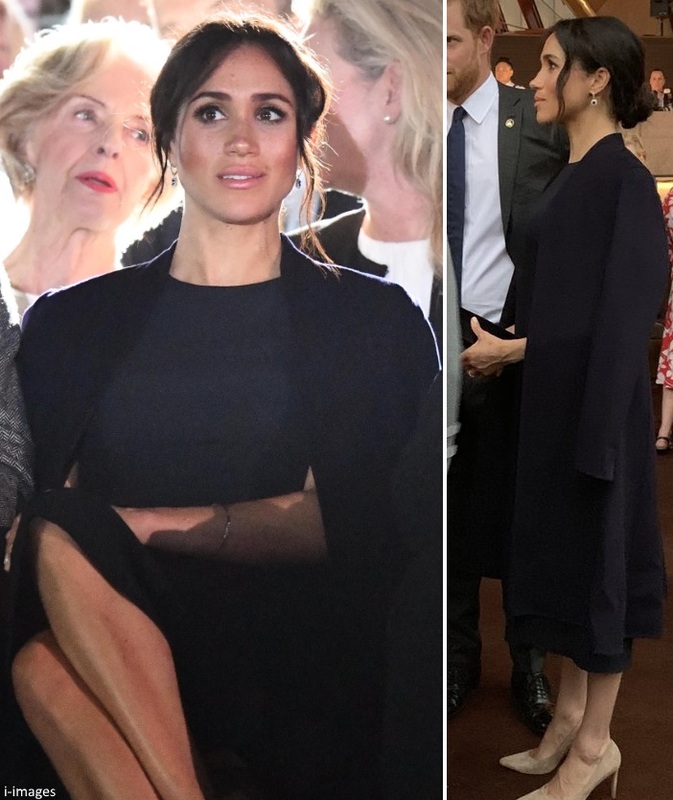 One thing that clip proved to me is that Meghan needs no stylist. She IS a stylist herself. I shopped in the regular styles sections until well into my third trimester with my first baby. I concocted all sorts of improvisations to allow for waist expansion.After the first one, I said to heck with it. I want to be comfortable and went for maternity once into the second trimester. One consideration--when I was having children it was the 60's and early 1970's. I was teaching. Contracts at the time required that a teacher who became pregnant resign once the pregnancy became obvious. One avoided maternity clothes for that reason and disguised your condition as long as possible. With the next baby I had an understanding female principal and the school was tucked away in the country; I was able to work through to the end of the school year. I realize that Meghan isn't going to lose her job because of pregnancy. Quite the converse. I may be wrong but I don't think it is uncommon to want to hang onto the illusion of one's familiar self when everything seems to be going out of control otherwise. Familiar clothing and styles are comforting, no matter how much the baby is welcomed. I don't think these two dresses are the same. I do notice that the waist line in the clip looks like it may be expandable. She looks thicker in the waist and top in the clip than she did in earlier years of Suits. I believe I noticed a change between the early years of the series and the last two years or so. Sometimes the catered food on set is hard to resist plus she admits to being a "foodie." Meghan looks wonderful. Not a fan of Erdem in general and the "winter bloom" look does not appeal to me at this time of year. Flowers better left to Spring and Summer. Agree with USAGranny 100% - and thank you for the mince pies tidbit, Charlotte! Very impressive ID work on the dress. Well done ladies! I am hoping that one of unintended consequences of the tough time Meghan recently had in the media and online is that the BRF will close ranks around her. It is one thing to have your own reservations or even differences of opinion with a family member, but it is something completely different to see the media and online warriors attack them. Nothing like an “us” and “them” situation to include a new comer into the clan. I think it is more than differences of opinion or reservations. A beautiful dress and Meghan looks amazing. Thanks, Charlotte. I hope the Sussexes enjoyed the festivities. Also don't like Erdem but she may be well covered---either the waist is comfortably elasticized or the elastic was removed. I bet she looked cute. And large flowers!! More than two colors without one being white. There was mention of Kate's dress being a repeat by a blogger, so it was nice that both duchesses wore something they already had. And I wonder if anyone sneaks those yummy pastries into a conveniently placed plastic zip-lock bag they happen to have in their purse. I would try. How do people identify from a small little swatch of fabric!? I like the dress, it’s a little fussy for my taste but like other posters have said after seeing her yesterday how could she fit into that???!!!! That dress has sheer overlay and that has zero stretch maybe she has it let out and panels put in? Which, makes no sense.... pregnant bodies do change on a whim but not that much!! It looks different around the neck too. In 2016 the dress had overlay only right below the ruffled neck on Meghan per the provided photo. That's not what I see in today's close-up photo. I thought the neck and edge of the sleeves looked different also. I agree--was just about to post about the sleeves ali! Maybe she had the dress altered and some elements changed. I admit I don't get the allure of Erdem but I bet she looked cute regardless. Most dresses can't be made bigger by altering. While an elasticized waist can be made bigger with looser elastic, the seam allowances on garments aren't big enough and finished in such a way that garments can be enlarged. If the sleeves and upper portion of the dress really are different and the lower portion fits a pregnant body now, it's a different dress. Perhaps a bespoke Erdem using 2015 material but a new dress IMO. I think the coat silhouette is perfect. Swing coats are so elegant, and its roominess is perfect for a pregnant woman. Hope Meghan wears them during her pregnancy. She looks happy as usual. Well, the video proves that Meghan had the Erdem dress before she got married. Meghan probably has a lot of clothes from before and she wants to wear them. Why shouldn't she? where does Prince Philip live? at Windsor? Prince Phillip spends the majority of his time at Windsor since he retired. Neither he or the Queen is very fond of BP. The Queen normally spend her weekends at Windsor as well. I read somewhere that most weeks she would go to BP on Monday morning and return to Windsor on Thursday, effectively spending half her time at Windsor. So happy to see Prince Philip , he seems fit and in good spirit ! Well, terrible clothes or’ not, I hope they did have a good time ! The instagram photo of them arriving shows Harry with such a big smile, it's just wonderful to see!! He must be over the moon to have not only such a lovely and compassionate wife but to have a much longed for baby on the way! I don't know how Meghan does it but even when I don't particularly like her clothes, she still looks stunning!! Is it just me but I don't get the allure of Erdem? The ruffles, the panels, the floral print, the generally unflattering cut, it's all just too much. Maybe these dresses look better in person but imho, they don't look great in photographs. Definitely not just you, lauri. I agree. Erden is such an unflattering brand. 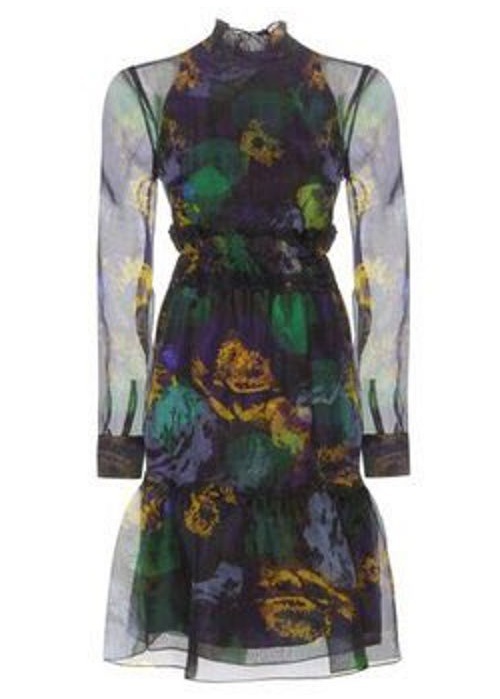 In all those years I have been following Charlotte‘s Blogs I think I might have liked only but one Erdem dress. I am not sure though if this really is the same dress. She wouldn’t fit in it anymore. At one point even letting it out wouldn’t make enough room. You would need a lot of additional material and altering the seems completely. With patterns it is also important not to make it look as if you just slapped some left over patches on- it has to fit. So you might even need more material. Maybe she had it reworked entirely into a top? I'm going to be blunt and I'm sure people will strongly disagree with me, but this is one ugly dress. Why would people think she's had the dress altered? She hasn't altered anything yet to fit her pregnant body. I wish she'd just embrace the fact that she's pregnant and needs maternity fashions. There are quite nice clothes on Seraphine and Rosie Pope among others. Other than poor clothing choices I think she looked quite lovely and glowing in the few photos we saw. Lauri, it is still strange to me to see Harry smiling so much. I didn't realize he could be so happy. Hope your family is doing well, Becca! I am in minority. I like this dress a lot. And several Erdem dresses are (IMO) very nice and elegant. Not all, but many. Some of my favourite Kate looks are from her 2011 Canadian tour, and the two Erdem dresses she wore are quite exquisite. I won’t speculate on the fit, since it can only be that: a speculation. None of the pictures allow for a view beyond the neck line. For all we know, it may be a custom made maternity dress with some of the same features as the original dress. I will say, though, cause it’s plenty visible, that Harry seems so happy! Not even the malevolent comments from all sorts of lowlife can put a shade on his face. I am thrilled for them. I agree, Liv! I like the dress too. I agree as well! I'm not usually a big fan of Erdem, but this one I really love. Ah yes, it's that time of year when all the food photos from the palace make me so hungry! I don't know how they do it. 1 normal sized pie is enough for me, but 12,000 mince pies, among all the other pastries and such? Hats off to them! If Meghan really is re-wearing this old dress, I don't see how on earth it could fit her pregnancy. The dress looks nice in the old photos, but I really do despise Erdem. Sometimes I feel like the duchesses wear Erdem designs because they're high-end, but they almost always end up looking too fussy or downright bad. I know I wouldn't mind if we never saw either of them in the brand again. Besides that, though, Meghan and Harry look really happy and relaxed! can't see much of what she is wearing but they are one hot couple! I agree that their Erdem choices have not been my favorites. My grandmother (she’s been gone for about 15 years now) always wore very high end clothes. There is just something about the nuances of quality fabric that really stand out in person. I’m wondering if Erdem has that appeal that doesn’t translate in photographs? Any Erdem experts out there that could enlighten me? We've seen a little over a year of Meghan as a royal. Looking back, I have to say she's worn some amazing clothes. The plethora of black and navy and cream has been a little boring at times, but her shoe and handbag collection makes up for it. Not everything she wears is to my taste of course, but I do think she has a very strong sense of style. I really doubt she needs a stylist per se, but she definitely needs a good tailor. In my opinion, her Wardrobe Fails have all suffered from Fit issues: too tight (Tuesday dress, of course, but she also had that unfortunate visible bra issue in Ireland), too long (Wimbledon trousers) or too baggy (last winter's slouchy coats, the toile dress she wore this summer). I wish she'd find a great seamstress who isn't afraid to tell her that her over the top high end designer duds need to be altered to fit her frame. Also, that she'd save her messy buns for running around doing errands in Windsor or date night with Harry. The Wimbledon pants fit they way they should. That look is in style right now. Michelle Obama wore several similar style pants on her recent book tour. They were not fit or tailored incorrectly. I also wish the comments about her hair would end. As a woman of color with similarly textured hair my guess is making her hair sleek and straight involves some chemical work and maintenance, and leaving it “messier” (though I disagree with this characterization) is often less time consuming. Please stop policing women’s hair. To me, what makes Meghan's hair look messy at times has nothing to do with how smoothly styled it is or isn't. It's the two pieces cut to chin-length that hang down on each side. They have been the same length since at least the wedding so obviously she keeps them cut shorter as an intentional element of the "messy bun" style she has adopted. If they were always hanging down, I'd wonder if she might be self-conscious for some reason with her hair pulled back (a scar? uneven hairline?) But she does wear her hair slicked back (Givenchy award) and even when it's not slicked back with a hair product, she often starts an appearance with all her hair pulled back but before mid-event the shorter pieces are hanging down or she's having to frequently tuck them behind her ears. Hair of any ethnicity, if cut shorter around the face like Meghan's, is not likely to stay in an updo. Of course, she has a right to cut her hair however she wants. But some people are going to think it looks messy! I understand but it is that very slicking back that you describe that I’m saying might not be just a simple matter of slicking back with a topical product. I don’t know what is involved in her hair maintenance but mine looks like hers from what I have seen in my case there is some time consuming management of “ethnic textured” hair involved. And she may not want to do that all the time. That’s fine if some people think it looks messy but the original comment stated someone should tell her to keep those hair styles for informal dates. That is literally saying she should be told how to style her hair and therefore does not apparently have the right to cut it how she wants. And that comment in particular is the hair policing that I have grown quite tired of. I see what you are saying Anon 00:49. I'd never say Megham SHOULD "slick back" her hair, adopt a particular hairstyle, or try to achieve a particular hair texture. Her hair is her hair and what she does or doesn't do with it is up to her. Some comments about her hair (like mine) were clearly referring to the side pieces she has kept cut short over the last year and so they tend to fall in her face or require constant tucking. I agree it's her choice but as I said, that does look messy to many people. And most likely, the only way to prevent hair cut that short from "breaking loose" from an updo or pulled back style is to use lots of very strong, almost "glue-like" hair products. Whatever she does to achieve the smooth slicked back look such as the one at the Givenchy awards (in terms of the "ethnic textured" hair issue you describe) must also involve some strong products to contain those shorter pieces. So when people say the slicked back styles look less messy, I'm not sure people are referring to the slicked back look itself or to its lack of "ethnic texture" as much as to the welcome lack of dangling side pieces that happen to accompany it. Hee hee I have changed my mind on the dress. I now think it is the same. I think she most have been a bit heavier when she originally purchased the dress so the chest area still works and she must be wearing it as an empire style dress so the waist is right below her chest area. The skirt has plenty of fabric to adapt to an expanding body. She may have also worn it with black slacks if it was too short or it had a hem that could be let down. Even in the earlier photos of her wearing it it looked almost like an empire waist style dress on her. I have changed my mind because the pattern of colors and shapes on the neck area looks identical in both photos. Thanks for sharing the Today show clip. Meghan is such a multifaceted woman! And she ended up on the best-dressed list for 2018, so her styling couldn't be too off. I don't keep up with what's happening in the UK much because we're having so much fun in the US, but I just read about the number of very low income children in the UK and I hope that both Meghan and Kate do a lot of repeats or wear less-expensive outfits. A few weeks ago, Queen Letizia wore a beautiful dress that was in the low $100s. All MM needs is her gorgeous hair and beautiful smile. I'm another one who likes the look...on her not on me! I heard that there was another recent visit,no photos allowed, to the Hub. We just enjoyed bowls of Harira with sides of the stuffed peppers from the cookbook for supper tonight.Yum! Audrey in NY: I'm curious about something....I understand that their wardrobe is taxpayer funded, but why is the focus always on the costs of what the women wear? Do people criticize the men for the costs of their clothing? And you are correct, very little in royal lives are relatable, but when you are spending public money you have to be aware of public sentiment and at the moment spending the equivalent of somebody’s monthly salary on an outfit you are going to wear once, just doesn’t look good. It is a tight rope royals have to walk, but also a problem the majority of people would not mind having. Only the Queen and her expenses are funded by taxes. Merry Christmas to all of you and your loved ones. How are you Charlotte? Are you ill? Did anything happen? Hello to All! First things first - Charlotte, glad to hear you are feeling better. You work so hard on this blog. It is truly a gift to all of us, but please take care of yourself. Next, I think Meghan looks fabulous. Simple, tailored chic. Also think that necklace has three diamonds. Maybe a "baby bump" gift from Prince Harry? Happy Christmas and Happy, Happy New Year to everyone.